The lovely 'My Family' collection by Nomination is dedicated to the special people in our lives. 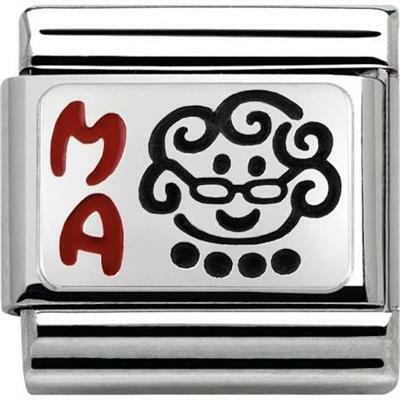 Pay tribute to your special 'MA' with this fun charm with a cute black Enamel drawing. This classic Stainless Steel link is detailed with Sterling Silver with the word 'Ma' engraved in red Enamel. This stylish addition to the Nomination collection is also a fun gift for a new grandmother.